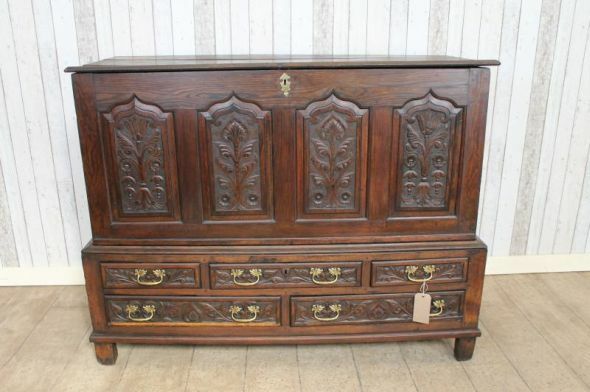 Recently acquired from a local clearance, this lovely large and impressive piece of country oak furniture features a large lift up lid revealing a large internal storage area. This sits upon a multi drawer base, making this a lovely piece of furniture for any period property. It provides a vast amount of storage, and we believe that it dates at around circa 1780. We think that the piece may have been carved later on and not during the time of production. Please be aware that this is an extremely old piece of furniture. It does show signs of wear and tear. As you can clearly see in the photos, there are a couple of small expansion cracks to the lid and there is a small piece of timber that has been used to replace a small part of one of the drawer bottoms.